Due to its innovative trigger construction, the Kessler Direct Trigger has achieved an unparalleled slenderness in design in the manufacture of bolt-action rifles with a Mauser 98-type action. The completely new trigger system is absolutely jolt free and is set at approximately 600 g to 800 g. The trigger guard of the direct trigger offers ample room which allows the rifle to be used with gloves without any difficulty. The trigger module system was created in the workshop of the gunsmith and master craftsman Kessler in 2000 and has been further developed ever since. The Kessler Direct Trigger design is protected as a utility patent. 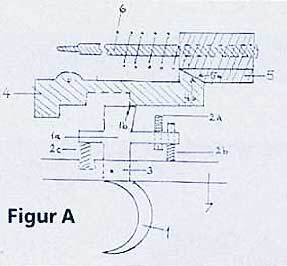 When cocked (figure A), the slanting surface (5a) of the cocking piece (5) is arrested by the slanting surface of the withdrawal fork (4a), which is in turn retained by the notch (1b) on the trigger sear (1a). 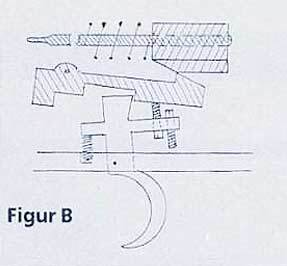 When the trigger (1) is pulled, the sear (1a) with its notch (1b) glides above so that the withdrawal fork with its slanting surface (4a) is forced downwards and the firing pin released. The depth of the notch (1b) can be set with an adjustment screw (2b), so that the trigger movement and resistance can be regulated. The leverage between trigger and sear (drawing 1:1.5) ensures an extremely direct trigger movement.